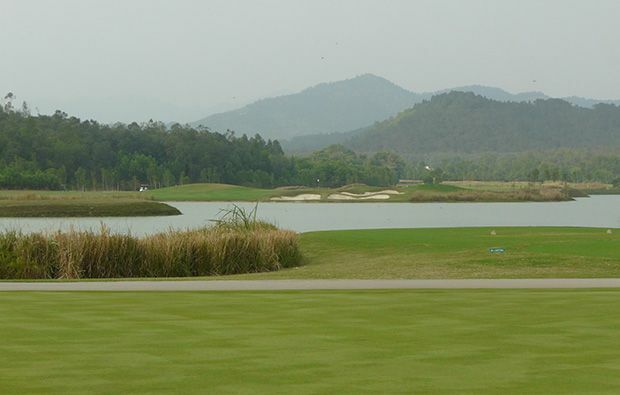 The opening hole is typical of what is on offer as you make your way around with a tee shot over water to a reasonably open fairway and then an approach to a green protected by bunkers on the right and still more water over the back. 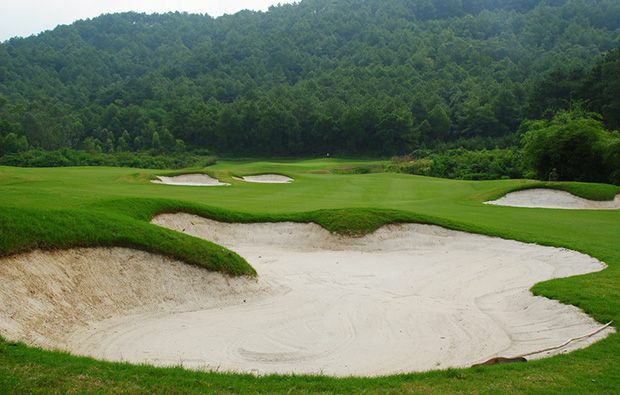 The 2nd hole is a dogleg left with water in play on both sides and a fairway bunker protecting the left side of the fairway – pretty simple approach to unprotected green. 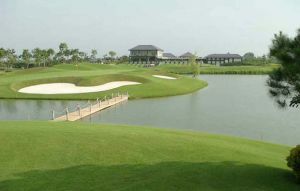 The 4th is an attractive par 3 and you tee off over the water to a green with a huge bunkers protecting the right side. The 7th which is another dogleg par 4 has water all along the right and bunkers either side of a very narrow landing area and two large bunkers surrounding the green. The 8th is a par 3 with an island green but with run-off areas it presents quite a large target and should not present too much of a problem if you can avoid the greenside bunker. 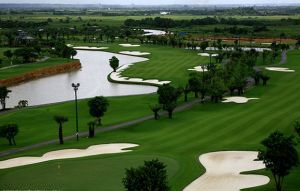 A very challenging hole to complete the front nine – a par 5 with water left and right and another stream running across the fairway in front of the green. Another dogleg par 5 to start the back nine with more water along the right and running in front of the green. The 11th is another challenging par 4 with a stream bisecting the fairway and three bunkers in front of the green. The 12th is a difficult par 3 with a long water carry to a green with bunkers left and right. Another shorter water carry to the 15th green which is a par 3 with a wide-open green. 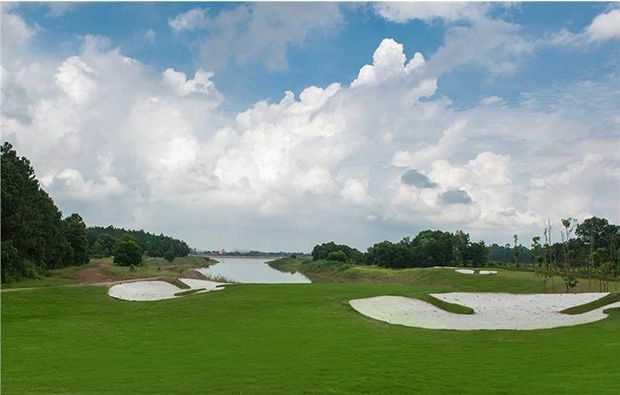 The 17trh is a wonderful par 4 with a fairway split by water with a bunker protecting the shorter right side off the tee and then its water all the way to the green with a large bunker in front waiting for the under hit shot. 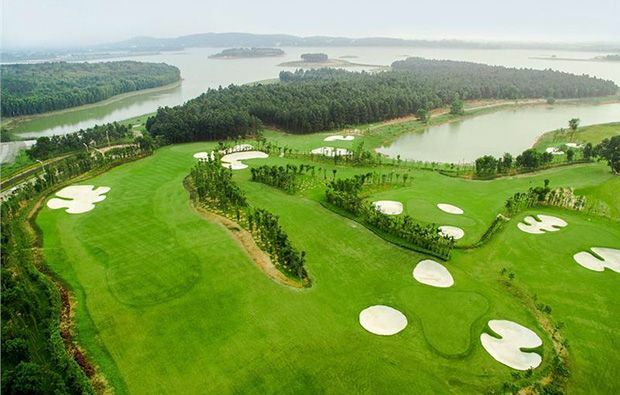 A very tough finishing par 5 with a large fairway bunker and then water all along the right for your second which needs to be played short of the lake which cuts into the fairway. An accurate approach required if you are to avoid bunkers left and right of the green. 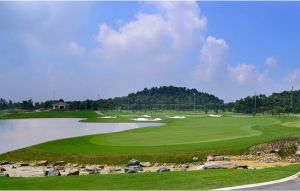 A pretty basic clubhouse with one restaurant with some basic changing areas – there is no pro-shop, and the chipping facilities amount to the lawn in front of the restaurant. It’s a real shame because the course itself is an enjoyable challenge, as evidenced by the crowds that descend on the weekend. This in itself presents a whole new layer of problems, as there doesn’t seem to be a strict enforcement of tee times, or indeed enough caddies to go round. It’s pretty easy to secure a tee time except at weekends when the courses can become pretty crowded. 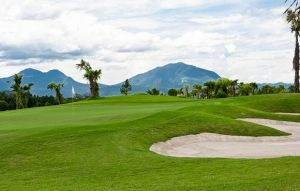 Dai Lai Star Golf Club has different Services to offer. Choose a date and number or players to see the rates.